I love your Name Help feature and … it’s finally time, after years of reading, to ask for help for myself! interests. Malcolm made us think of a leader with a heart of gold and unorthodox methods, because of the TV show Firefly, and Gareth reminded us of the steadfast, humble, easygoing knight of Arthurian legend. When it comes to girls names, it seems like we’re perhaps a bit more conservative than with the boys. Names we like include Clara, Lyra, Julia, Aline, Thalia, Maeve, Eve, Petra, Iona, and Sabine. Our taste runs towards the feminine but not frilly. is a name that I just don’t like! Complicating matters further: we have a short last name that starts with a vowel. It rules out certain first letters: D absolutely, likely H, B, and F.
Please help us! It feels so unsettling not having this kiddo’s name picked. 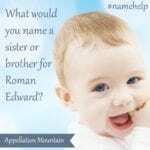 It sounds like you’ve found your naming groove for sons, and it seems like you’ve got a pretty solid idea of the qualities you’d like in a daughter’s name, too. Still, it’s often harder to name a second or third child. Waiting for that ‘aha’ feeling is understandable – and yet, lightning doesn’t always strike. So far, you’re proceeded logically, identifying qualities you prefer and finding names that meet that list. I wonder if that means you should look for something slightly different. 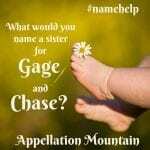 There’s no rule that says sibling names need to sound like a perfectly matched set. And sometimes the guidelines we give ourselves for choosing a name lead us away from some really good choices. Maeve came to mind before I read your list; and Vesper, I think, could work well. But Vesper strikes you as a little too different. But none of the more traditional feminine names – Clara, Julia, Eve – seem quite right, either. Let’s try a few more ideas and see if anything feels right. Beryl – Beryl is a gemstone name and a Sailor Moon character, but I was thinking of Beryl Markham. Markham became the first woman to fly solo across the Atlantic, east to west, and published a best-selling memoir about her adventure. And that’s only a small piece of her unconventional and adventurous life story. If the sound isn’t a deal-breaker, I think Beryl works well with Malcolm and Gareth. Hanna – Have you seen the 2011 movie starring Saoirse Ronan? I have not, but I know a family who named their daughter after the character. She’s quite fierce, from what I understand. The name, however, is plenty mainstream and feminine. It would never strike anyone as an out-there option. (Though the Hannah spelling is significantly more common, and that could be a headache.) I know H is on your maybe-not initials list – but I like this one enough to suggest it anyway. Lara – The Tomb Raider character makes this one tough, but Lara seems like a traditional, feminine name. But there’s also the Doctor Zhivago tie. Plus, Lara feels nicely pan-European and familiar in the US without being widely used. It’s a slightly more mainstream alternative to Lyra. Laurel – If not Lara, maybe Laurel? The Arrow character brought it to mind, but it has some other great imagery. Laurels symbolize victory and achievement, from ancient days to our own times. Laureline – This one comes from the French sci fi comics, Valerian and Laureline, recently adapted as a movie by director Luc Besson. It wasn’t a huge hit, but the comic books have decades of history behind them. It reminds me slightly of Lyra, and while it’s longer and potentially more feminine, I think it stays on the right side of frilly. Selene – Was Sabine inspired by the Star Wars character? 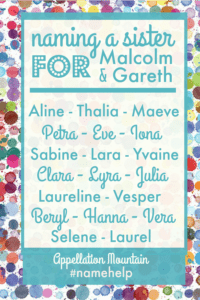 It’s such a gorgeous name, and feels like a logical sister for Malcolm and Gareth. But if it’s not quite right, Selene has a similar sound, plus ties to two heroic characters – Selene of the Lunar Chronicles YA novels, and, of course, the Underworld series. Vera – Vera comes from the Russian word for faith, but reminds us of the Latin verus – truth. It feels vintage like Petra, familiar like Clara, and shares the V of Vesper. But maybe it’s too close to your name? Yvaine – Okay, Yvaine is rare, by any standard. And it’s of recent coinage. Neil Gaiman first used it for his heroine in Stardust, played by a young Claire Danes. The movie became a cult favorite of sorts, so plenty of people will recognize it. Gaiman probably based the name on Owain and Yvain, giving you a tie-in to Arthurian legend, too. But it feels feminine and unusual – possibly an alternative for Vesper. Overall, I’m still most drawn to Maeve from your original list. But of my suggestions, I really like Beryl. It sounds like the kind of inspiration you’d like for a child’s name, and hits the right feminine-not-frilly, familiar-not-common note. Maeve Eleanor, maybe? Or Beryl Victoria? But I feel like I’m leaving dozens (and dozens!) of options still out there, so let’s open this up to the readers. 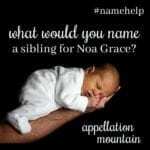 What would you name a sister for Malcolm Alexander and Gareth Christopher? I like Bronwyn, Evangeline, or Helen. Clotilde. Call her Tilda, if you want to shorten it. It seems to go with Malcolm and Gareth, two names of much dignity. Plus it means bravery in battle or something akin to that. What about Cambria? She’s a bit Clara, a bit Julia, as historic as Petra. I love Selene! It reminds me of cat woman (her name was Selena Kyle right?) There was an Irish princess named Taisie and I’ve always loved that name. Love, love, love your boys’ names. I have a Gareth of my own. I love the suggestion above of Imogen, like the heroine of Shakespeare’s Cymbeline. Along similar lines – Beatrice, Viola, Hermione (which of course also has the Harry Potter reference). Una from the Fairy Queene. Verity (creator of Dr. Who). I love Imogen for you! Imogen is a brilliant idea! She’s such a strong, yet feminine character and Shakespeare is a slightly different category of nerdy than either of the boys’ names. I love Lyra! I would also suggest Liesel (the Book Theif) as it is similar to Louise, but distinct in sound. An alternate spelling is Liesl (which is apparently a variant of Elizabeth). And for what it’s worth, I am Julia and I love my name. Oh – and a few more in light of your Whedon reference: Echo! Eliza (as in Eliza Dushku) is also a stunner. So I studied abroad in Scotland for a year, and Malcolm and Gareth are both really well-known Scottish names. So my first thought was: yes, there’s a theme there! Maeve and Iona both fit really well (Iona is a Scottish island!) Other Scottish names you might consider are Eilidh (pronounced ay-lee), Isla, (eye-la), Ailsa, Elspeth, Fiona, Isobel, Kirsty, Maggie (short for Margaret), Sorcha, and Una. A few ideas of names that sound feminine and strong to me: Celia, Edith, Lydia, Claudia, Paola, Naomi, Virginia, Geneva. I LOVE Iona and Sabine! Both are in the running if we have a girl. There’s a tie-in between Iona and Malcolm, however, and that’s the root in St. Columba: Malcolm is from Colm, from Columba, who was an Irish Saint who brought Catholicism to Scotland thorough his monastery on the Isle of Iona. I have a Callum (same root) and still love the name Iona. But I thought I’d point out that link if it somehow became too much (or a great) tie between the two names. Viola is my very favorite, though, and I think Viola Josephine or Viola Katherine would be right up your alley! Lyra is my favorite from your list. Assuming the inspiration is from The Golden Compass, I wonder if you would like other spunky girl character names, like Ramona, Matilda, Eloise, Anne/Shirley. Or in the nerdier vein, maybe Arya (too obvious in 2018??) or Anya, if you like more Joss Whedon (or Sydney, Willow, Cordelia, and so so much more). Maybe instead of Sabine, Sabriel (as in, the Abhorsen Trilogy). But, for what it’s worth, it strikes me that Cosima would be lovely with Malcolm and Gareth. I love Maeve, Petra, and Vesper from your list. I really like Abby’s suggestion of Vera. Are you into “The Last Avitar” series? Korra, Jinora, and Kitara were some amazing heroines from those stories! Merida (the first Pixar princess–a feisty, athletic, independent medieval Scottish girl with wild red hair, name meaning one who has achieved a high place of honor) and Freya (norse goddess of love) were two that immediately came to mind on the heroine theme. They also hit some similar notes as Lyra, Thalia, Maeve, Eve, Petra, and Iona, to me anyway. Veronika, your name is also one of a heroine . Cool tradition to bestow names of hero. – Ruth: Ruth in the Bible, Babe Ruth, RBG on the Supreme Court. Heroic name. Matilda immediately came to mind since it means “battle worthy” and is an ancient royal name steeped in history. Beryl… is that pronounced like barrel? Like a wooden barrel? Rhymes with Meryl. Different vowel sound, and slightly different emphasis. My first thought was Marie, as in Marie Curie.